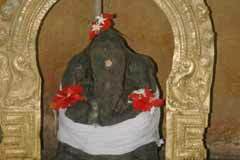 10 day Ratha Sapthami in Thain month (January-February) is a very important festival in the temple. This marks the ‘U’ turn of Lord Sun’s Rath-Car from South to North beginning the six months called Utharayanam from Thai to Aani month – June-July. Seasons are calculated by the movements of Sun God. On the first day of each Tamil month special pujas and abisheks are performed to Lord Suriya-Sun who heads the Zodiac family. This is called Maha Abhishek drawing huge number of devotees. 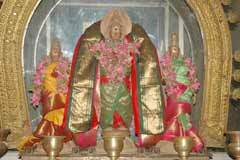 Also Saturn (Sani) and Jupiter (Guru) transition days are celebrated with special pujas. Lord Sun graces in the temple facing west with a Lotus on both hands accompanied by His consorts Ushadevi on the left and Pradhyushadevi on the right. 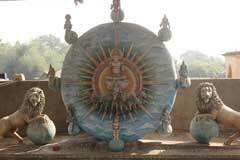 The Navagrahas (nine planets) are without their their vahans-vehicles. 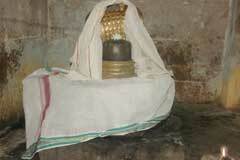 The temple is open from 6.00 a.m. to 11.00 a.m. and 4.00 p.m. 8.00 p.m.
Sri Suriyanar Temple, Suriyanarkoil, Thanjavur. Devotees perform a ritual called Nadi Pariharam, Navagraha Homas and Surya Archana. They also perform with sugar pudding (Sarkarai pongal) which is considered very important here. They do abishek and archana to the planets as prescribed. 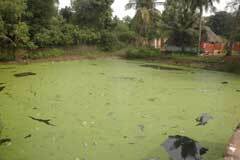 They also offer wheat, jaggery and their farm yields equal to their weight – a ritual called Tulabaram. Those seeking child boon offer cradles. The Prasad is distributed among the visitors. Feeding also is followed besides usual abishek etc. 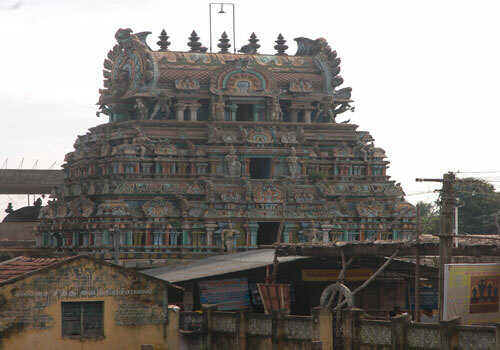 This is a temple dedicated for the nine planets – Navagrahas. The devotee can worship all the planets as presiding deities. In other temples, the planets are but sub-deities only. 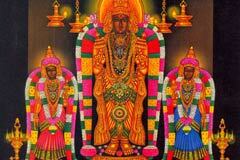 The speciality is Sun God graces with His consorts in wedding form. He is not furious but calm and gracing. Every planet has its own shrine and is only graceful in nature offering solace to the devotee. There is no vehicle for any planet. 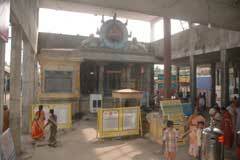 Bus facilities are available from Kumbakonam, Mayiladuthurai, Aduthurai. Anaikarai-Tirupanandal. 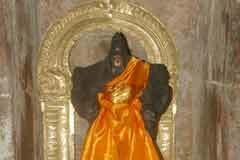 The devotees should get down at Tirumangalakudi Kaliamman temple stop. Suriyanar koil is 2 furlongs from here.